This is one of my favorite holidays! First, because i am very grateful that Saint Patrick took care of them snakes. And second, because i love the parades! Every town is getting ready. I took this shot another night sneaking around the Old Friary in Carrick on Suir. 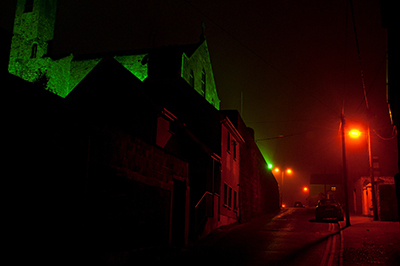 The green light changed all the usual night colors, and coupled with the fog it made the streets look dreamy and mysterious. 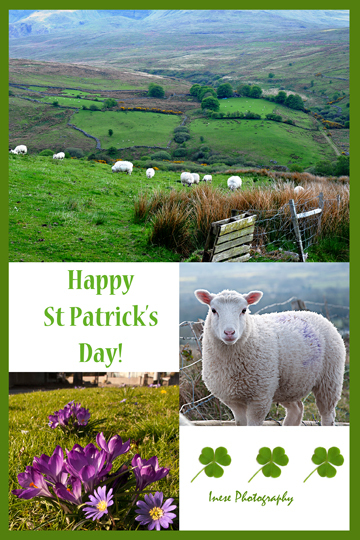 Also, i have made a Patrick’s Day card. Tip of the day: Name your photos meaningfully and store them by years. Don’t clutter your computer, don’t keep all those flowers and waves and sunsets. Keep one of each that you like the most. St. Patrick took care of the snakes? Tell you the truth, even in the U.S when I was there and St. Patrick was celebrated I had no clue what the history behind it is. For that matter not even the americans did, what I knew and they knew is that there was going to be a lot of beer. By the way the first picture, green and red lightning of the houses and the street with the dark skies and mixed in between is beautiful. Reminds me of some kind of fantasy scene from a fantasy movie for kids. Glad you found this post 🙂 It is one of those I posted before I went live with this blog. . This green lighting is on just for a few days, and it looks like a fantasy movie indeed 🙂 The red is actually a yellow bulb light, but the green changes all the other colors, so the yellow looks like dark red. walk through the waist high grass in your slippers…..only if you pay me. Did Patrick also drive out the lizards or leaches for that matter? Don´t think so, I´m not walking through those places in slippers. Inese – I love, love nice greeting cards. I can walk into almost any shop and if they have greeting cards, that’s where I’ll head. I wish people liked to send cards more than they used to because they can be fun or silly, offer hope or congratulatory for another hurdle crossed. Sheri, everything about your relationship with Tom sounds like a fairy tale, even that I know that it is also a hard battle with his condition. Inese – Tom has saved every card I’ve either sent him and I’ve done the same with his cards and letters. During Vietnam, my first husband wrote almost everyday and those letters are all so precious to me and I’ve never entertained the thought of throwing them away. My Dad’s letters over the years and cards fall into that category and so many more. What can I say, I’m sentimental and so is Tom. I often leave a card for him on his nightstand with a note tucked inside or redeemable coupons. Of course, he does the same for me. He’s such a romantic and almost always sets my card along with a bouquet of fresh flowers and a small candle. I believe it’s these connections we have to the people we love and that we love and those who love us in return that make our lives so special. Sheri, it is so true, I guess I am sentimental as well. I keep some letters and cards and many other memorabilia. Our family are pretty much into family history work.